With a unique flavour coming from Jersey's rich and fertile soil, Jersey Royal new potatoes have been grown on the island for over 130 years. 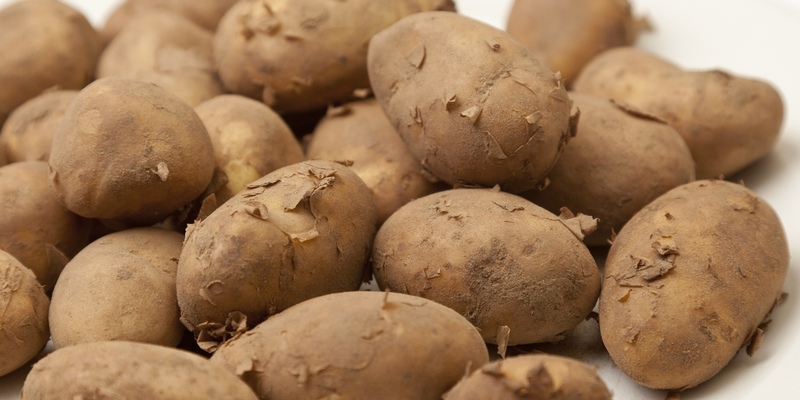 Jersey Royal potatoes have a distinctive taste and work well in a range of dishes. These delicious potatoes have been grown since the late 1800s, and they are Jersey's largest export, with a crop of 30,000-40,000 tonnes a year. For those of us not lucky enough to live on the island itself, the arrival of Jersey Royals in supermarkets and greengrocers heralds the true beginning of spring, and as such the potatoes are often paired with other seasonal heroes such as asparagus and wild garlic. Celebrate the start of spring with this collection of Jersey Royal recipes. Dominic Chapman's rack of lamb recipe is served with crushed Jersey Royals drenched in anchovy butter, while Mark Jordan's salmon recipe with marinated Jersey royals, asparagus, crab and dill demonstrates that they work equally well with fish. There are plenty of glorious potato salad recipes in this collection, too, such as Dominic Chapman's Jersey Royals salad with spring onions and aioli, and Shaun Rankin's Warm salad of Jersey Royals with goat's cheese, pine nuts and fresh figs.